We are prone to overcomplicating the ways of Jesus. If you want to be great, be a servant. 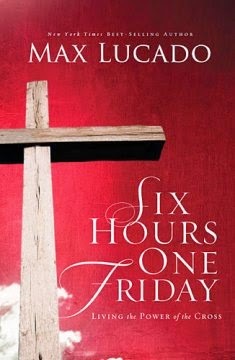 Six Hours One Friday is yet again reason why Max Lucado's writings are so popular in the Christian marketplace. Lucado has a fantastically readable approach to his writing - appealing to a broad range of people from students through pastors. This book is a prime resource for devotions and worship in the Easter season. While it is not a long read, it is a rich read that inspires worship and awe for the love God has for us through His son Jesus Christ. This is the sort of book that can easily be consumed in a single reading, but I'd suggest spacing it out over a few days so that you can dwell on the story in deeper fashion. Pray your way through it and let it inspire and challenge you toward spiritual growth. Lucado walks his way through the material many churches cover on Good Friday in this book. It recounts the last hours of Jesus' life on earth leading up to and including His crucifixion. Lucado's descriptive writing makes it feel almost as if you were there watching it all transpire. Lucado draws you in and then illustrates the powerful message that despite our failings, our mistakes are not what define us as Christians. Death is not the end for us, this life is not all that there is. Lucado brings grace and hope into the story of tragedy in an inspiring way. I would recommend this book without hesitation for individual and for group studies.